When a movie with a name like Ladies in Lavender lands in the art house, it's a pretty easy guess as to what kind of movie this is. 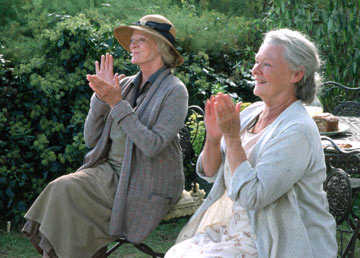 Maggie Smith and Judi Dench, two magnificent British actresses play sisters who live near the shore in Cornwall. It's the 1930s, and Germany is beginning to assert itself across Europe, but things are still fairly calm in their corner of the world. Until a young man washes up on the shore. Janet (Smith, Harry Potter and the Prisoner of Azkaban, Divine Secrets of the Ya-Ya Sisterhood) and Ursula (Dench, Chronicles of Riddick, Home on the Range) take him in and slowly tend him back to health. Ladies in Lavender is the first directing and writing outing for actor Charles Dance (Swimming Pool, Gosford Park), and is based on the short story by William J. Locke. It definitely feels like Dance stretched to flesh out a full-length feature, because much of the film feels pointless. The Widdingtons learn that their charge, Andrea Marowski (Daniel Bruhl, No Regrets, Good Bye, Lenin!) 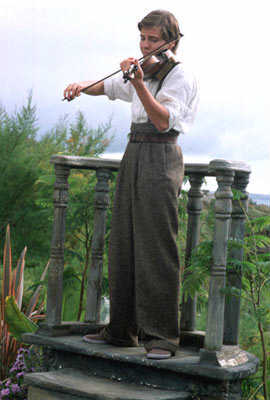 is a young Polish violin prodigy. Initially, their only common bond is German. Janet is passably fluent. Ursula cannot speak the language at all, but feels a great deal of affection for him. She soon develops a crush. Smith and Dench are marvelous actors. Both are Dames, and deservedly so. They have worked together many times in the past, and when they do so here there is a feeling of ease and familiarity. They settle into their roles quickly, Janet the sterner one, and Ursula the one younger at heart and more passionate. However, every time the plot turns to Ursula's affection towards Andrea, the film takes a nosedive. Dance plays everything so seriously that it sometimes becomes unintentionally amusing. Ursula and Janet sometimes realize how ridiculous the situation is, but Ursula's feelings are stronger than her initial reluctance. Instead of acting on them, she pines away or dotes in Andrea like a teenage schoolgirl. Things become more complicated when Olga Daniloff (a horribly Russian accented Natascha McElhone, Solaris, City of Ghosts) hears Andrea playing. She is young, stunningly beautiful, and her brother happens to be one of the most famous violinists in the world. Andrea dreams of going to America, or doing something amazing with his life, and is in Cornwall mostly to heal. He spends a lot of time there, his English gets better, Ursula falls deeper in love, and Andrea realizes that he needs something more. To complicate matters further, Andrea's doctor, Dr. Francis Mead (David Warner, Kiss of Life, Superstition), is making advances on Olga, who continually rebuffs him. He decides that an easy way to exact revenge against her is to exploit the fact that he saw the both of them speaking German. Everybody begins acting like a bunch of jealous teenagers, much to the amusement of Dorcas (Miriam Margoyles, Being Julia, Chasing Liberty), the Widdington's feisty housekeeper. Margoyles, Warner, and Smith and Dench are all great, but one has to wonder what the purpose of Ladies in Lavender was. It feels like a generic period piece that moves slowly, with a story just a tad more ridiculous than normal. 1 hour, 43 minutes, Rated PG-13 for brief strong language.